Yes, Caterer Search has found him out. "London Mayor Boris Johnson has reneged on a pre-election promise that only hotels and restaurants paying a ‘London living wage’ would be promoted by Visit London ahead of the 2012 Olympics. Johnson, who increased the London living wage from £7.20 to £7.45 an hour earlier this month, made the vow at an election debate held by campaign group London Citizens in Westminster on 9 April. "Work with London Citizens to ensure that London’s hotels and hospitality sector pay a ‘Living Wage’ by the 2012 Olympics and work with ‘Visit London’ and other Tourist Guides to only endorse Hotels and Restaurants which are accredited ‘Living Wage’ employers and sites." Ending the day where we began, London Citizens' Stefan Baskerville kindly sent me this photograph and the following message: "There were sixty five of us – four priests, three nuns, three Shiite muslim representatives, babies in pushchairs, mothers, trade unionists, students. We sent a delegation (Rev Angus Ritchie of St Mary’s Cable St Church, Sarfraz Jeraj of Hyderi Islamic Centre, Matilda Von Sydow of LSE Students’ Union) to meet management, who got stopped at the front door by City policemen. We stayed outside with bright purple placards and banners until they were let in, and they then successfully negotiated a formal meeting with the level of management which could decide to pay a Living Wage – that should happen in September." Sounds like a result. 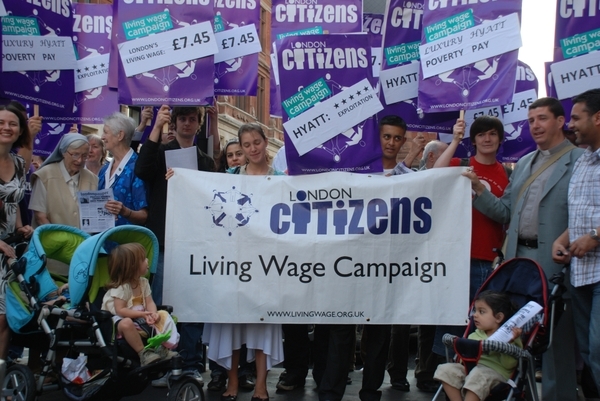 As I type, protesters from London Citizens are gathering outside the Hyatt Andaz hotel on Liverpool Street to demand that all its employees are paid the new London Living Wage of £7.45 an hour. Mayor Johnson's pledge that all workers in the GLA group would receive the LLW was one of the bigger surprises of the mayoral election campaign. No wriggling out of that one. The mayor has since honoured that pledge and later this morning will announce at the Canary Wharf launch of A Fairer London: The 2008 Living Wage in London, a report from the City Hall Living Wage Unit, that Barclays plc is the latest convert to the living wage. London Citizens hope they and Mayor Johnson can work together to spread this good practice throughout the capital. How about it, comrade Boris?